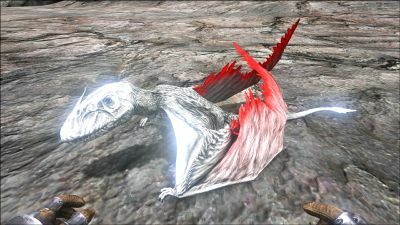 The Dimorphodon (di-MOR-fo-don), also referred to as Dimorph, is one of the creatures in ARK: Survival Evolved, added to the game on the 18th of July, 2015. Dimorphodon equesica is another of the Island's Jekyll-and-Hyde creatures. It is normally passive, sometimes even friendly. When provoked, it becomes very aggressive, even against larger creatures it has no business fighting...often to its own fatal end. Dimorphodon can make short work of smaller opponents, however, due to its large (but lightweight) skull and teeth. Barely over a meter tall, Dimorphodon should be low on the food chain, but its incredible speed and surprisingly strong bite make it fairly dangerous, especially en masse as they tend to attack in groups. A flock of angry or hungry Dimorphodon can take down prey several times their size, so survivors should take care not to hunt near where a flock is gathered. Dimorphodon is one of the creatures on the Island that is easily domesticated for companionship, but its use in combat is also quite clear: It will hunt in large groups to seek out enemy dino riders directly, harassing them to no end, regardless of the might of their mount! Dimorphodons tend to stay close in groups of 2-5, however they can rarely be seen alone. They do not attack the player unless they are attacked or an egg is stolen. They fight using the Raptor tactic (hit and run) and tend to dart towards their target, deliver a strike, then dart away. A small but dangerous flyer, the Dimorphodons are small, fast, and very hard to hit. They are great pets and hunters once tamed, but in the wild, they will attack if provoked and are very hard to hit for players without ranged melee weapons (pikes and spears) and mounts that do not have vertical attacking capabilities. Tamed Dimorphodons will attack players if directed to attack an animal with a rider, making them excellent human hunters during raids. Watch out for these when walking along rivers and swamps, and some shorelines. In large groups they can become quite a menace, trying to tame one when a large pack is present is very hard so you may want to knock or kill the others so you can tame the one you want. Once in a group they take a swarm mentality, and due to the hit and run attack style, you'll have one hitting you as soon as the other leaves your vision. Shotguns and large mounts should end your troubles quickly. The Dimorphodon appears as a small flying reptile with a notably round head. They look similar to bats, and because of this can often be confused with the cave-dwelling Onyc. However there are a few notable differences in appearance, the main one being Dimorphodon's wide color scheme. Whereas similar species tend to have only brown, tan and black colors, Dimorphodon bolster striking and bright colors such as reds and greens in addition to more mundane blacks and browns. They can even come in dazzling shades of white, which may seem appropriate given this creature can often be found in the tundras. This section displays the Dimorphodon's natural colors and regions. 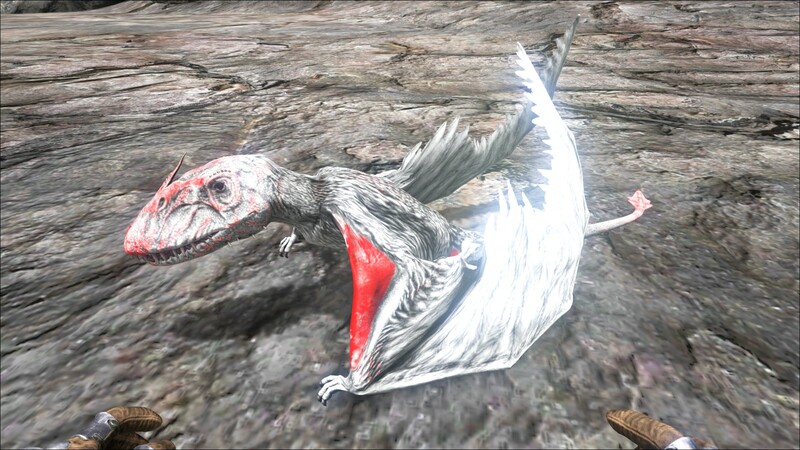 For demonstration, the regions below are colored red over an albino Dimorphodon. The colored squares shown underneath each region's description are the colors that the Dimorphodon will randomly spawn with to provide an overall range of its natural color scheme. Hover your cursor over a color to display its name and ID. For example, "cheat SetTargetDinoColor 0 6" would color the Dimorphodon's "body" magenta. Since the introduction of the bola in May 2016, this weapon is probably the easiest way to KO a Dimorphodon. Once entangled in the bola, walk up to your immobilized prey and shoot it in the head with a tranq dart or tranq arrow. An Electric Prod with 100% melee damage (engram-grade) will instantly knock-out a Level 120 Dimorphodon if hit directly in the head. This is another easy method to take one out, especially when you only want to knock out a single Dimorphodon when there are several others nearby. Hitting a Dimorphodon that is not attacking you poses quite a challenge to any survivor. Trying to shoot the Dimorphodon from the side made many a survivor scratch their heads due to arrows sticking out of the dimo but no apparent result in behavior. In this case, server lag, client lag and an incredibly small hit-box will make the client calculate the shot as a hit and thus rendering the arrow, whereas the server calculates the same shot as miss due to lag/delay. Playing on a server with ~30 Ping @ 30fps its necessary to "lead" the target by about one inch of the screen when using a tranq rifle even on short distance while the Dimorphodon is flying at 90° to your line of sight. Therefore, clever survivors will make sure the Dimorphodon is angry at the survivor, thus flying straight towards him, which makes landing hits very easy. Another method is to mount a flyer like a Pteranodon or an Argentavis(preferably low level, low dmg) and fly to the target. Attack it, so it aggroes the Argentavis/Pteranodon. Fly away a few meters, land, unmount and shoot a tranq dart/arrow into its head (since the Dimorphodon is heading for your mount, your position will be slightly off his flight-path. For a head shot, you will have to lead the target again. Just take good measure of the dinos level as one tranq arrow to the head of a flyer deals about 150-250 dmg, add the damage you did with your bird attack and you are likely to kill a low level Dimorphodon. This method works very well for high level dinos (100+), for lower levels a slingshot might work as well. After enough torpor is applied, the Dimorphodon will begin to flee. Now is the time to position oneself directly in the wake of his flightpath (behind him) and shoot him from there to bring it finally down. Sidenote: Having an Argent or Pteranodon at hand also makes for easy prime meat gathering. Survivors with enough foresight will scout for a valuable Dimorphodon, note the position and color, then gather some prime meat and quickly down the Dimorphodon. When trying to tame low level Dimorphodons, the Beelzebufo and Scorpion tactics will work better as all projectiles deal increased damage to flyers, often killing the low hp Dimorphodons. If hunting alone, many choose to bring a Beelzebufo as a mount, rather than using a weapon. Using a frog with high melee damage will frequently produce greater success as a leveled frog is able to apply more torpor per hit, reducing odds of the target escaping. Fewer successful hits to KO. Beelzebufo with high melee can easily harvest raw prime from swamp creatures like Sarcosuchus and Titanoboa with a few special attacks. Paraceratherium generally provide more prime meat, but can be dramatically more dangerous in terms of crushing damage. As with any pet, frogs provide longer duration meat storage; just make sure to throw several stacks of raw meat into a Beezlebufo's inventory first, to act as a buffer. The primary drawback to hunting with a frog is that you have one more positional variable to control. Trying to hit a small moving target while jumping can be challenging, and the frog turns much less quickly than the Dimorphodon, allowing them to easily evade by changing direction. A secondary drawback is that a frog with exceedingly high melee damage, while able to take down higher level targets in one or two hits, will frequently kill targets with lower health. Dimorphodons have a wide-ranging but consistent flight pattern, and will always return to locations they have previously visited. Do not chase while observing; if you wait, it will return. Dimorphodons come to rest on the ground infrequently, and you want to mentally note these locations before alerting the target. After your target is selected, follow from ~3-5 tiles behind. If Dimorphodons feel pursued, they will stoop to land but immediately take off again; however, if they fully land, they remain on the ground for about 5 seconds regardless of pursuit. Follow from the maximum distance you can close in about 2–3 seconds of sprinting. When the Dimorphodon has actually landed, close the distance with a sprint. You will have a few heartbeats' time–before it alights again–to line up a solid head-shot from point blank range. If you lose this opportunity, wait for the next one–unless you are exceptionally skilled at hitting small, moving targets, this is likely your only opportunity for a guaranteed head-shot. After the first shot, it will take off again before most crossbows or rifles have reloaded; a bow or compound bow may score 1-2 additional hits during this time. However, it will fly directly in the direction it was facing, at eye level for a few seconds more. If you approach from behind for the head shot, you can easily score another 2-3 hits with a crossbow or rifle during this flight. If you wait for the Dimorphodon to land again, all torpor from these initial shots will be long gone and you will, essentially, be starting over with a greater risk of killing your target. Therefore, you must take the remainder of your shots while it is attempting active evasion. After several more hits, the Dimorphodon will turn to fight. It will stoop to fly in rapid circles around you, aiming attacks for your head–these attacks happen so rapidly that a novice hunter may want to wear flak or chitin armor. Stand still and count the number of seconds it takes the Dimorphodon to make one full circle and reappear directly in front of you, and take note of the height of the previous circle. Dimorphodons will vary height during attacks, but will typically make several attacks at the same level before changing height again. Noting height and timing when the Dimorphodon will reappear in front of you should give you enough information to anticipate when they'll next appear in front of your weapon, and land enough shots to KO the target. You will waste ammo–LOTS of ammo. Bring 2-3x as much as you think you need, at a minimum, so that you do not need to abandon the hunt halfway through to retrieve ammo. Expect to take shots that are not perfect; if you wait for perfect shots, you will never KO this particular dinosaur. Bring a scorpion with high-leveled melee attack. Mount up and wait - at a distance - for the Dimorphodon to land. When it does, race up and position your scorpion's main body over the Dimorphodon, forming a cage with its legs. The dimorph should be directly under the scorpion's head, almost cupped in the pincers, where it has the most collision. When you are in position, strike! Wait 9-10sec between strikes, but the Dimorphodon should be trapped underneath you and unmoving if you positioned right. The downside is that the dimorph can still hit you, so bring flak armor and health brews if your scorpion has low damage or the dimorph is high level. In some cases the dimorph is able to escape anyway; in this case you should jump off of your scorpion, making the dimorph aggro onto it instead of you. Let the scorpion attack at will - it will land at least a few hits, raising torpor - and meanwhile you watch its tight circles and hit it with tranqs. With this method even the highest-level dimorphs can be downed in only a couple minutes. A group of Dimorphodons, even two lower-level ones, will attack so quickly that you may need to kill all of them (including your target) to avoid player death. You may need to watch your target for several minutes, without moving, to ensure its flight does not come into contact with any other Dimorphodon's flight. If it contacts any others, kill the Dimorphodons that are not your target while their flight patterns are divergent. Dimorphodons have very little torpor (100 + 6 * level) and lose it very quickly. They do not lose torpor as quickly as a Compy, but very nearly. Make sure you have a stack of narcotic on your person before you begin the hunt, and do not anticipate being away from the animal at all during the tame. If you need raw prime meat, recruit a friend to deliver it. The Electric Prod(100% damage) can instantly knock out a Dimorphodon below level 27(included) and inflict almost no damage. A prod with 376% or higher damage can knock out any wild Dimorphodon. This section describes how to fight against the Dimorphodon. Dimorphodons land for very short amount of time so, using ranged weapons other than a Fabricated Sniper for when they land is not a great idea. Fabricated Snipers will take a lot of skill to get at most a single headshot. The best method for taking out Dimorphodons is a sword or pike mixed with flak armor. Dimorphodons can attack in packs in which can be difficult to take a single one at a time unless you and your tribe arm up with Assault Rifles you can spray and pray the skies with a rain of bullets. Dimorphodons have quickly dropping topority so KOing a single one without any armor may prove to be a bad idea since it will get up very quickly. Using a group of their own kind against them with high damage will prove to be an efficient method even when against a large group. Due to their relatively slow flight speed and large turning arc you can wait for them to fly towards you for an attack, fire a shot into their head, and then quickly strafe left or right to avoid most/all of their attacks. This can be used for knocking the Dimorphodon unconscious or killing them. The Dimorphodon does not damage a mounted pet when attacking but instead attacks the rider. Many times survivors who are unaware of this can think that their mount is taking negligible damage and then find themselves dead or very near death. They deal large amounts of "damage" to the durability of armor being used. They are dangerous in hordes, but you can easily out run them due to their speed and turning radius. Dimorphodons are used for fighting or as pack animals. Although they are too small to ride, they make for good swarming creatures; a group of six can often kill stronger creatures without suffering any casualties. Due to its size, the Dimorphodon is extremely hard to hit, not just for players, but for wild dinos too. By leveling up health and damage on a tamed dimo, you can turn the small flying critter into a battle bat that has your back while mining, gathering, and farming for food. However, you should be careful around creatures with a large area of effect in their attacks, like the Stegosaurus or Brontosaurus, as they can easily hit flocks of Dimorphodons. In a worst-case scenario, you could lose your entire flock against such a creature. Tamed Dimorphodons can be carried on your shoulder, and can be thrown to attack the target you are looking at by double-tapping f, but if you're mounted you won't be able to pick it back up without dismounting. When sitting on your shoulder, Dimorphodon is very useful while gathering supplies as they attack Titanomyrma and Compies if put on neutral. Along with being excellent pack/swarm creatures when used offensively, Dimorphodons also have the ability to shield whoever they are following, be it another dino or a human player. Setting Dimorphodons to follow you at the lowest distance will make them circle around you constantly, because of this, the Dimorphodons will shield you from attacks as they will get hit instead. This is quite useful when fighting creatures such as the microraptor, troodon, beelzebuffo, titanomyrma, other dimorphodons, dilophosaurs, and Onycs. Dimorphodons, aside from these other uses, also enjoy a notable distinction: they are extremely efficient for breaking open Bee Hives and aiding in the taming of Giant Bees, arguably more so than using firearms or explosives. Being flyers, a small swarm of Dimorphodons can easily reach and quickly break open any hive when whistled to attack it, without angering the drones, provided the player keeps a far enough distance away while they do this. Once the hive is broken and the queen is exposed, they can be whistled to passive and brought back, without harming the queen or drawing the attention of drones so long as they are called back quickly enough. Once returned to the player's position, they can be set to neutral to guard any mounts or other tamed dinos while the player is occupied with the long-chase process of taming the queen bee. Perhaps one of the best uses Dimorphodon-loving survivors have had this creature for is cave exploration. Due to their great maneuverability and ability to ride one's shoulder, they can easily navigate and fight in the most crowded of cave networks. When needed, you can simply toss it off your shoulder and whistle attack on any desired target. Another perk of this is the fact that it can help carry loot and resources found and harvested in the cave without getting stuck like other pack animals. 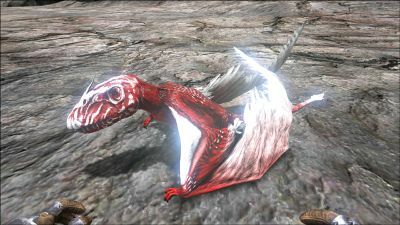 Leveling only speed on a Dimorphodon pack may be a good way to make an effective hunting pack that can keep up with a combat trained Argentavis. Leveling only health and melee damage is a good strategy if your plan is to leave them inside your base to deal with intruders while you are offline. Sometimes pay you a visit in your house. Hence don't aggro wild dimorphodons flying around close to your house/base as they tend to follow you even if you are in a building. Make sure you use normal (closed) walls for building a room (for instance a breeding room for dimorphs). When spawned/tamed using console commands, a 'saddle' slot is shown. The dossier described Dimorphodon as a Jekyll-and-Hyde creature, in reference to R.L. Stevenson's novel, Strange Case of Dr Jekyll and Mr Hyde, and Dimorphodon's dual personalities of passive and highly aggressive. Dimorphodon spawns commonly around majority of the map it spawns in. Ironically, it's one of the rarest creatures on Aberration. Consider yourself lucky to sight one there! This the only flying creature that can have its Movement Speed upgraded. This page was last edited on 20 April 2019, at 16:13.